Growing up visiting national parks I always loved hiking and biking in the great outdoors. It wasn’t until I moved away for college that I truly embraced all the benefits of the city. This combined with my work at a small non-profit lead me to a deeper understanding and appreciation of the relationship between community issues, the built environment and active lifestyles. Today I enjoy working closely with communities to help them become healthier and more enjoyable places for the people who live there. 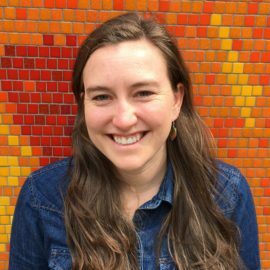 Katie’s background in design, planning and community engagement fuels her passion to create more lively, safe and equitable places in our cities. Working directly with communities she helps people find a healthier lifestyle that best suits their needs while contributing to the improvement of their surrounding environment. She graduated from the Ohio State University with her BS in Landscape Architecture and from the University of Washington with a Master of Urban Planning. She enjoys using multiple modes in her weekday city life, while venturing to the Pacific Northwest wilderness for hiking and exploring on the weekends.